The nation of Brazil has given the world many dribbling magicians over the years, but none were as beloved or fondly remembered as Mané Garrincha. It's easy to understand the masses' infatuation with him – Garrincha's tale is an inspiring story of a man who overcame multiple birth defects to become one of football's greatest stars. With him Brazil won two consecutive World Cups in 1958 and 1962. Having been born with a deformed spine and a right leg that was six centimeters longer than the left one, Garrincha's future as a professional football player seemed rather bleak from the outset. In addition to his unsightly physical attributes, he was also quite small for his age; this led to his sister starting to call him "Garrincha", a Brazilian word for a wren. His real name was Manuel Francisco dos Santos. With his doctors claiming he was unfit to play football, Garrincha decided to prove them wrong. At 19 years old, he joined a Botafogo training session; once there, he displayed his extraordinary talent by dribbling all around Nílton Santos, a respected member of the Brazil national team. As he quickly came to realize he would never want to face the youngster as an opponent, Santos urged the club officials to hire Garrincha, and they duly obliged. 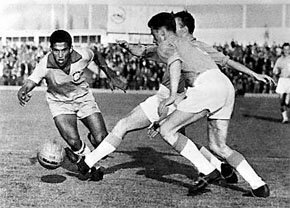 Garrincha started off his professional career by scoring a hat-trick against Bonsucesso in his first game for the club. During the next five years at Botafogo, he emerged as one of the greatest right-wingers in the world and a one-man wrecking crew. The opposing defenders had a hard time watching the tricky dribbler, even if they knew that he prefered going to the right, his explosiveness made him one step ahead. His skillful and slightly arrogant style of play and a seemingly endless repertoire of dribbles and feints quickly made him a fan favorite wherever he went. In 1957, he led Botafogo to their first Campeonato Carioca title in nine years. With his sensational displays at Botafogo, nobody was particularly surprised when Garrincha was called up to the 1958 World Cup national squad. That Brazil team was especially famous for its attacking prowess, with Garrincha, Didi, Vavá, Mário Zagallo and a 17-year-old Pelé providing the ammunition. After sitting out the first two games, Garrincha started against the formidable Soviet Union; it took him only three minutes to throw the opposition into disarray by dribbling past two defenders and hitting the post. Brazil eventually won the game 2-0, with Garrincha's impressive performance ensuring that he started every game from there on out. After setting up the first two of his side's goals in the final against Sweden – which Brazil won in dominating fashion 5-2 – Garrincha was voted to the World Cup's All-Star Team. After leading Botafogo to two more Campeonato Carioca titles in 1961 and 1962, Garrincha was once again selected to the national squad for the 1962 World Cup in Chile. Brazil arrived at Chile as reigning champions and an obvious favorite for the title; however, their chances took a turn for the worse after Pelé suffered an injury in their second match of the group stage. This put even more pressure on Garrincha as the focal point of the team's attack, and people were starting to wonder if he was capable to lead the team on his own. As it turned out, he was. With two goals against England in the quarter-final and another two goals against Chile in the semi-final, Garrincha played the best football of his career, dazzling the home crowd and the television audience in the process. On the day following their defeat, the Chilean El Mercurio newspaper asked its readers, "What planet is Garrincha from?" Brazil eventually defeated Czechoslovakia in the final 3-1, with Garrincha winning the Golden Ball as the player of the tournament. Outside the pitch, he had began a scandalous love affair with a Brazilian singer who according to the sayings had run into the locker room with celebrating Brazilian players and hugged Garrincha who was standing in the shower. The illegitimate relationship and the football player’s taste for celebrity life did him somewhat less popular among the fans. The 1966 World Cup was a different story from the glory four years before with Brazil being a shadow of its former self and getting eliminated in the group stage. Garrincha played the first two games and scored in a 2-0 win over Bulgaria. After his last international match, it became clear that Brazil had never lost a game while fielding both Garrincha and Pelé. 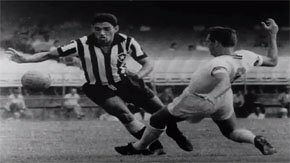 After 688 games and 276 goals with Botafogo, Garrincha left the club in 1966. He spent the rest of his career flitting between many different clubs in his homeland before finally retiring in 1972. He died only eleven years later due to excessive alcohol consumption. Alcohol problems had plagued him his entire adult life and then he died 49 years old he had wasted all his money. Millions of people took to the streets for his funeral procession, in a line from the Maracanã to his final resting place in Pau Grande. His epitaph says: "Here rests in peace the one who was the joy of the people – Mané Garrincha." See the documentary Garrincha, Joy of the People (Alegria do Povo, 1963).